A former stately home has been severely damaged by a fire which caused part of the roof to collapse. 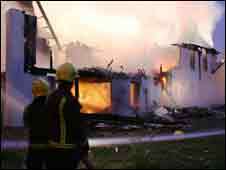 Six firefighting crews were called to Woolston Manor in Chigwell, Essex, in the early hours. Essex County Fire and Rescue Service said no-one was inside the building when the fire broke out. The older part of Woolston Manor was undergoing renovations but other more modern buildings are used as a gym and leisure complex and were not damaged. A fire service spokesman said crews used water from the swimming pool on site to quench the flames and had to use pumps and an aerial platform to get water inside the building as walls and the roof collapsed. Divisional Officer Mick Osborne said: "It's been a difficult incident to tackle because of the initial problems in maintaining a water supply, along with the age of the building. "The fact that it is under renovation made access difficult at times due to scaffolding and other things associated with working around what essentially is a building site. "Following the partial collapse of the old building we had to work carefully but once we had established a good water supply we were able to take control and tackle the fire successfully in sectors. "But full credit to crews - they put in a lot of effort to get the water supplies going and then in containing the fire to the old part of the building and protecting the new part which is an operational Virgin gym and leisure centre." Relief crews, sent to the site to ensure hotspots did not reignite the fire, were expected to remain on site until Wednesday afternoon. Police and fire officers will carry out a joint investigation into the cause of the fire.